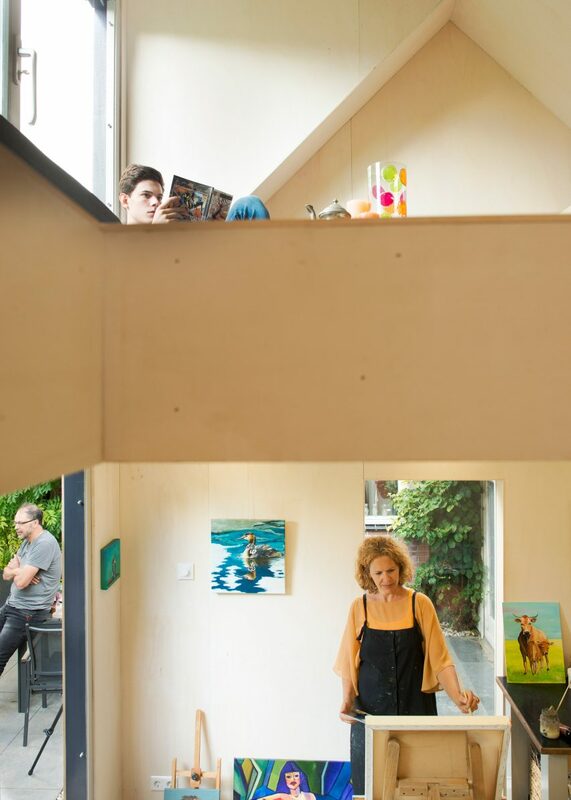 Dutch architecture studio Open Kaart has transformed an old shed in the city of Woerden into a painting studio by enveloping the existing brick structure in a larger timber shell. The Rotterdam-based practice was tasked with repurposing a simple shed after completing the renovation of the main house and its garden. The clients wanted a space to run painting workshops from as part of their business. 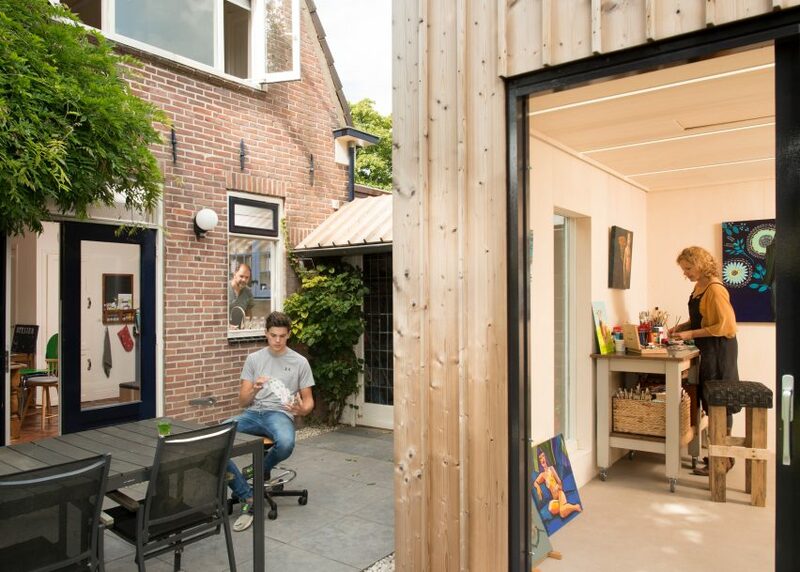 In addition to an appropriate light-filled studio, the building needed to retain the storage space provided by the previous shed. The small, uninsulated brick structure had no foundations and a leaking roof, but rather than demolishing it to make way for a new addition the architects preserved it, and incorporated it into the new building. “By building on the existing shed, a studio with attic could be realised within a limited budget,” explained architect Pieter Graaff. Three of the original brick walls were retained as part of the efforts to limit costs. The new addition was constructed around them, with the timber volume extending upwards and outwards from brick form. 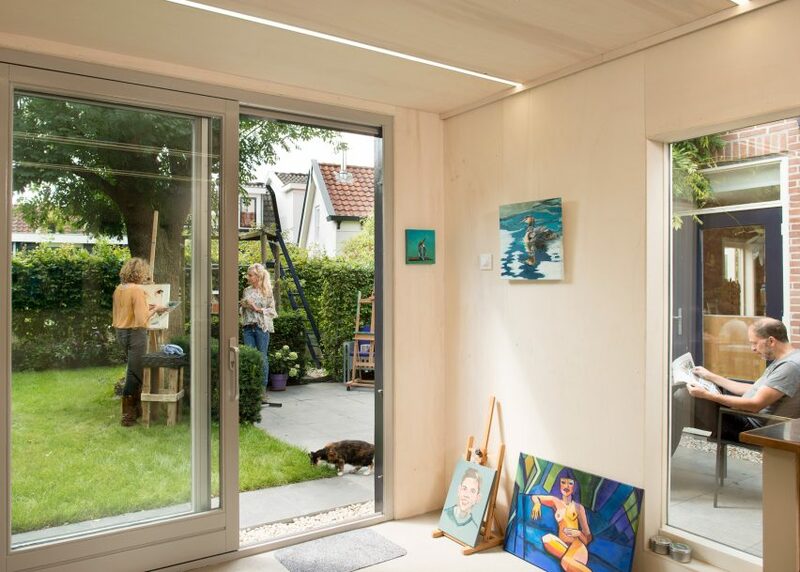 The only interruption to the homogenous wooden surfaces are the black-framed sliding glass door and window, which ensure both the studio and attic space receive plenty of daylight and natural ventilation. The studio’s simple interior is lined with plywood panels that incorporate LED strip lighting, rails for hanging paintings, and an infrared radiator. Electric underfloor heating and an electric boiler ensure the building can operate sustainably. The large dormer that extends from the sloping roof accommodates a space which can be used for storage or as a compact lounge area with a view towards the canopy of the nearby tree. In the future, the building could be extended to accommodate a bathroom and used as a studio apartment by one of the client’s children. Studios are being built in the gardens of houses around the world. In Lillehammer, Norway, Jon Danielsen Aarhus designed a gabled shed to accommodate the hobbies of a recently retired couple, while in London Eckford Chong added a blackened-timber garden studio to a refurbished house. Photography is by Rufus de Vries.